Explore your world, find a quick fact, or dive down a Wikipedia rabbit hole with the official Wikipedia app for iOS. With more than 40 million articles across nearly 300 languages, your favorite free online encyclopedia is at your fingertips. Night reading – Appearance controls let you read Wikipedia in comfort, with dark mode, text size control and image dimming to customize how you read. Places – Find Wikipedia articles about places next door or across the globe, with a map and location based search experience. On a trip or your daily commute, with Places it’s easy to learn more about the world around you. Find and search – Easily find what you’re looking for by searching within articles or using Spotlight. You can even search with your favorite emojis! Quick access – Add Wikipedia to your device’s Today screen to pick up exactly where you stopped reading your last article, or see the top-read articles and trends of the day. Easy touch navigation, including 3D touch – Multi-touch gestures like swipe, tap, and 3D Touch features complete essential tasks more quickly and simply. Save articles – Save articles for reading later, even when you’re offline. Multilingual support – Search for and read Wikipedia articles written in any Wikipedia-supported language — there are nearly 300! 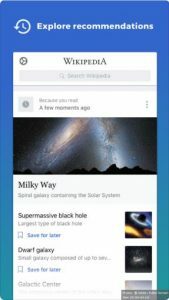 Share – Easily share articles, images, and facts from Wikipedia on social media or by email. Or use Handoff to continue reading articles across your iOS devices. The Wikimedia Foundation is a nonprofit organization that supports and operates Wikipedia and the other Wikimedia projects. The Wikimedia Foundation is a charitable organization funded mainly through donations. For more information, please visit our website: wikimediafoundation.org/wiki/Home.